Canter activity advertising is one of the medium of advertising which has the capability of putting advertisement at different places on best times. Canter activity advertising is done by fixing illuminated hoardings, banner or billboard on a van or truck which moves around the city and can be parked at targeted places. Canter activity advertising the products or services and moves across the places as per the targeted location. Canter activity advertising is also called Mobile Van Advertising or Roadshow advertising. Mobile van advertising options available across India at affordable rates through SmartAds.in. 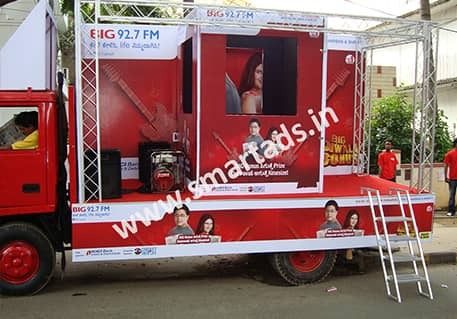 Mobile van advertising services are listed for various location like van advertising in Mumbai, mobile van advertising in Bangalore, mobile van advertising Hyderabad, mobile van advertising in Chennai and many other location in India. Smart Ads offer Mobile Van advertising options at PAN India level. Roadshow Advertising is a best mode of advertising to attract people with illuminating display ad. Roadshow advertising is most effective to reach mass audience. Roadshow advertising takes less span of time. Roadshow advertising gives flexibility to advertisers. Illumination and the ability to conveniently shift to the desired locations as per the client`s requirement. Roadshow advertising can be placed on important places to reach mass audience quickly. Roadshow advertising also helps advertisers to achieve greater market share Roadshow advertising also offer back lighting facilities for evening times which also make it more attractive. Roadshow advertising allow advertisers to display their advertisement by keeping in mind target audience and target location. Van advertising best locations are busy routes, busy carriageways, near retail parks and near Shopping Centers. Van Advertising gives maximum visibility and impact is realized through their dominant size. Van advertising have the ability to customize the layout. Van advertising gives advertisers more exposure and branding. Van advertising gives more exposure to advertisers as it acts like a mobile moving hoarding, Van advertising is rapidly increasing since past many years. Van advertising became one of the favorite mode of advertisement in quick period. Van advertising is also very much cost effective as compare to Radio advertising, TV advertising and Newspaper Advertising. Canter Activity Advertising in Mumbai. Canter Activity Advertising in Delhi. Canter Activity Advertising in Kolkata. Canter Activity Advertising in Bangalore. Canter Activity Advertising in Ahemdabad. Canter Activity Advertising in Surat. Canter Activity Advertising in Pune. Mobile Van Advertising in Mumbai. Mobile Van Advertising in Delhi. Mobile Van Advertising in Kolkata. Mobile Van Advertising in Bangalore. Mobile Van Advertising in Ahemdabad. Mobile Van Advertising in Surat. Mobile Van Advertising in Pune.